FANBOY PLANET.com . 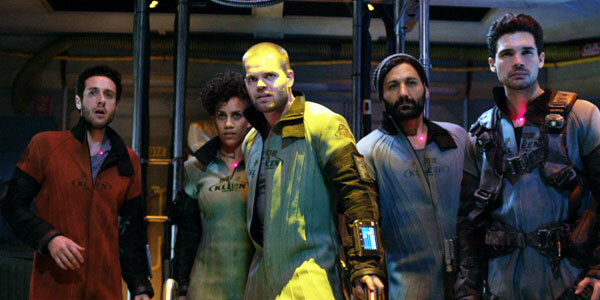 : The Expanse :. I resisted because the cover made it look like one of those monolithic science fiction “epics” where the human story takes a back seat to the cosmic one. But I was proven wrong. It's a great book, go out and read it as soon as you can. If you like it there are five more in The Expanse series, as well as a handful of short stories. There’s even a short prequel story you can read online right now. 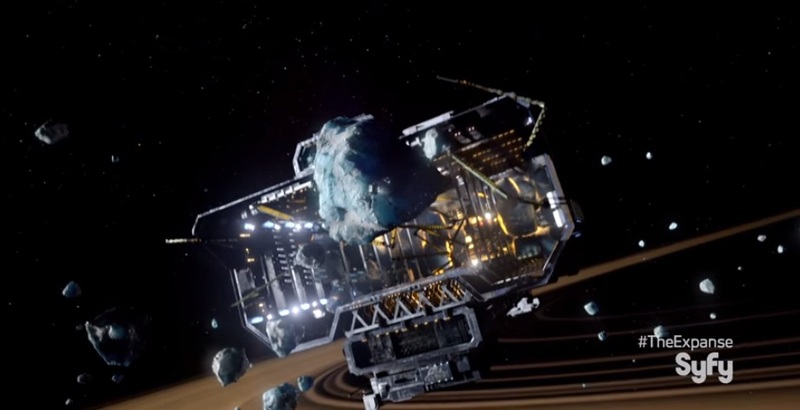 Shortly after finishing Leviathan, I became aware that the SyFy channel was developing The Expanse series, ten hour-long episodes for the first season which would arguably cover Leviathan Wakes. For years the soundtrack for the previous paragraph would have been screeching violins of panic backed by low cello moans of foreboding. But given SyFy’s recent original productions, some of which have actually been excellent, this did not cause the same dread I normally would have felt as someone who had survived both Riverworlds and (dear lord forgive me for giving it a name) the Flash Gordon series. Instead I was hopeful, Corey’s series was placed in the hands of writer team Mark Fergus and Hawk Ostby (Children of Men, Iron Man) and Alcon Television Group. This was very good news. This was important because one of the special things about The Expanse is the strict reserve it places on technology. It needs to feel like it would actually work. The science is explainable without hand-waving away hyperdrives and magic gravities within ships, or lasers that can be focused into massively exploding projections. It is a hard science fiction story, and that is something that could refreshingly be approached by a reasonably talented production company. So when I had a chance at Comic-Con to sit in the Indigo Ballroom, with an audience of similar hopefuls, I held my fanboy breath for a few minutes. And a few minutes was pretty much all it took to confirm that this was going to be a great and faithful adaptation of the series. Perhaps this is the show to seal the deal and prove that SyFy could now be considered a force for good in the universe. As the first episode concluded, the audience erupted into grateful applause. Yes, this was going to be great. The only sadness is that we have to wait until December for the remaining episodes. 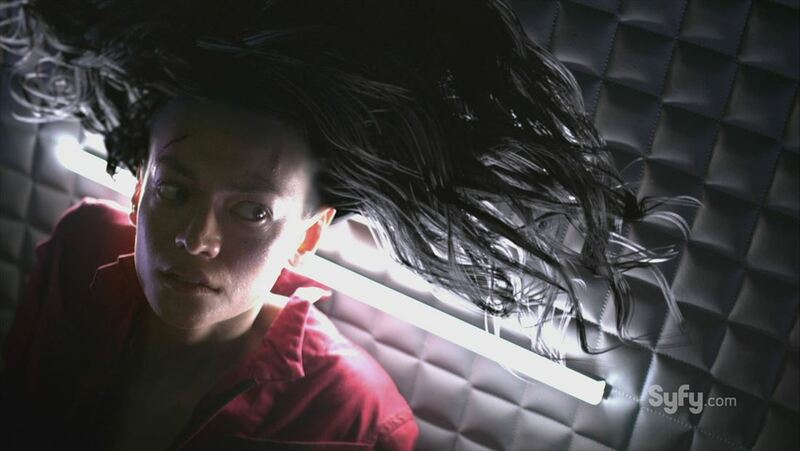 So what’s special about The Expanse and why is this series going to be a different science fiction experience than we’ve ever seen on television before? The key is its grounded believability, and the complete picture of our solar system being colonized. Mankind branching out from Earth, rising to the challenge of expansion, and the problems both technical and social that arise. It's broad and subtle at the same time. It's not something that television science fiction has a history of doing well, much less on SyFy. We're two hundred years in the future, light speed has proven too hard a nut to crack, so all the action takes place within our solar system. Technological advances have shortened the travel time between Earth, Mars, the asteroid belt, and a few moons here and there. It’s much more like sailing from Europe to the New World in the 1800’s. Distance combined with diverse environments has affected the colonists, both physically and socially. “What is human?” is already a question beginning to form on many lips. We find each colony local hosting virtual nations, with social, economic and political differences. And of course the distance and alienation sponsors suspicion, some merited and some manufactured. There’s no war. Yet. But there are more than a few indications that it wouldn’t take much to start one. And that could be devastating to all. And that’s where the personal stories start. With opening scenes lifted directly from the novel and continuing faithfully throughout the episode, SyFy delivers on so much of what is important here. The two “heroes” of Leviathan Wakes are joined by a third’s storyline originally not introduced until Caliban's War, the second book in the series. 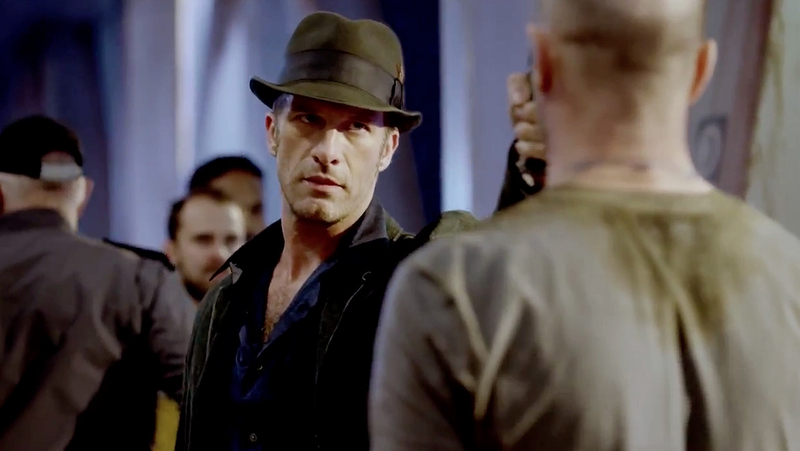 Josephus Miller (Thomas Jane) is a “belter” detective, a stunted native of Ceres, he’s not as lanky and tall as most of his peers due to an accident of birth. Jane brings a worn down yet streetwise, and still just a little too idealistic for his own good to his portrayal of Miller. This wonderfully matching what we would have expected from the novel. Jane is going to be fun to watch. Jim Holden (Steven Strait) is the executive officer on the Canterbury, an ice freighter bringing in a large shipment of solid water. Holden is a counterpoint to Miller, ready to put everything on the line in in perhaps a reckless fashion, with a different kind of idealism that believes humanity can make the right decision providing it's given all the information. The two are set for some interesting conflicts as they work towards the same goal with different tactics and for different reasons. 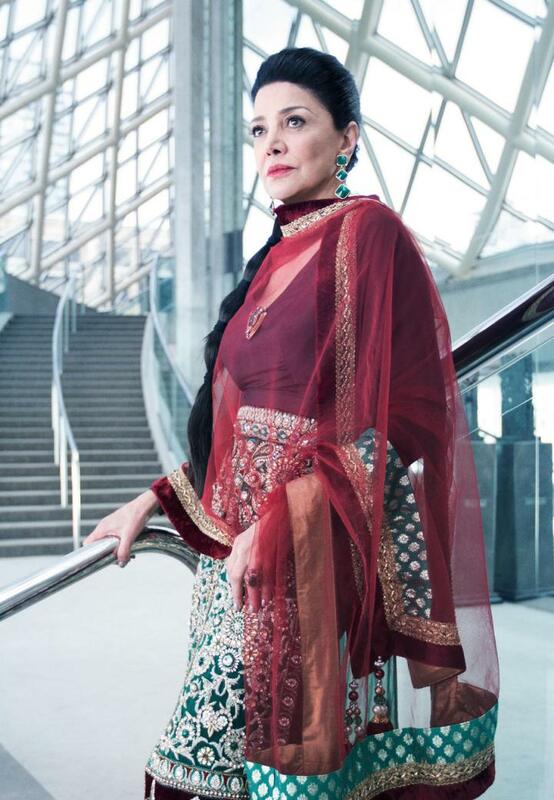 And Christen Avasarala (Shohreh Aghdashloo) is the U.N. Deputy Undersecretary of Executive Administration, investigating “cold war” espionage and potential terrorism by off-world forces. She is coldly practical in her interrogation, but we don’t see much of her infamous “vocabulary” in this initial episode. Originally Avasarala doesn’t show up until the second book, Caliban’s War, but bringing her in earlier adds a bit of needed diversity and a point of view grounded on Earth. Few should complain about this adjustment to the story. How these three will work, and understand each other and a conspiracy that truly threatens to “change the nature of humanity.” It’s a threat both alien and native, a plot both twisted and straightforward, that keeps our heroes guessing as to how they’re being manipulated - in many senses of the word. And I anticipate this will be a real pleasure to watch, as the director spends time on so much detail from the story that gives us a rich feel as to what these alien worlds are like. In a big break from their prior space-opera efforts, SyFy has provided us with a science fiction story that truly honors it’s source material. It’s the little things, and the details that make the difference. The space ships and environments discard the over-shadowed productions that typically marked previous SyFy efforts. Many interiors are well lit, exposing lavish sets with incredible detail. The evolved street patois spoken by belter natives of Ceres establishes both the alien feel and Miller’s connection to it. Similarly the camera spends some time watching Miller observe a transplanted earth bird whose kind has learned new patterns of flight in the low-gravity world, both familiar and alien, and newly beautiful. Space ship acceleration and flight adjustments have real effects on the human bags of blood they carry, something that figures strongly in the plotting of the books. And we’re introduced to Holden in the midst of a zero gravity tryst with a sheet-wrapped crew-mate. The zero g effects in this episode were amazingly convincing and that bodes well for the series that will depend on them on a regular basis. Overall the special effects and CGI work were great, but make no mistake - these are actual sets. In the Comic-Con panel following the preview the team confirmed that they were often on huge sets, not just redresses of scaffoldings or green screen effects, and they’ve preserved them for use in following seasons. So with so much going for it, do we have a guarantee of success here? Hopefully, but with all such productions we’ll find that some episodes will have slightly different executive staff working on them. Already two separate directors are listed for different episodes. A consistency of writers should help, and as mentioned SyFy seems to have gotten over it’s “low-bid” method of developing made-for-tv productions. I'm hopeful. 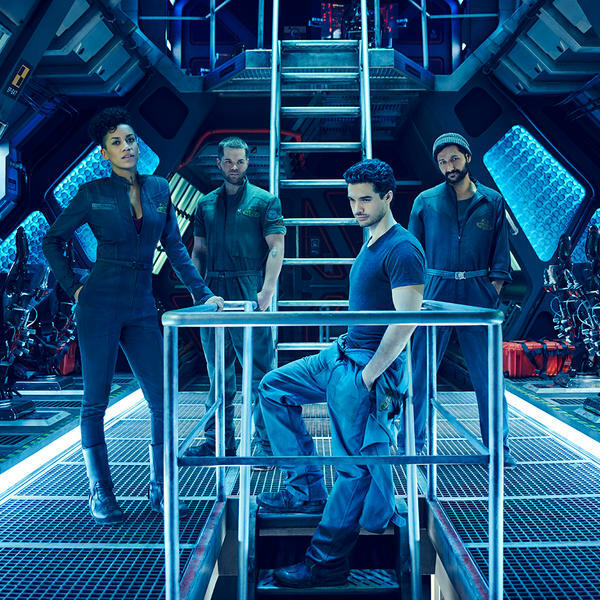 In short, The Expanse promises to be groundbreaking television, not only for SyFy but for the medium in general. It has the potential of being to science fiction television what Game of Thrones has been to epic fantasy television. Assuming the pace of the first episode matches the rest of the season, the 10 hour-long episodes should run through Leviathan Wakes, which has an ending suitable to a season or even series ending epiosde. In the meantime you have around four months to crack open the books, maybe just the first two, and enjoy one of the most popular series around before the show hits in December. I think this is one of those times, much like HBO’s Game of Thrones, when reading the book is a real benefit to enjoying the series. And it gives you something to do while you wait for December to arrive. Of course you can watch the trailer a few times too. *James S. A. Corey is the pen name of writers Daniel Abraham and Ty Franck.